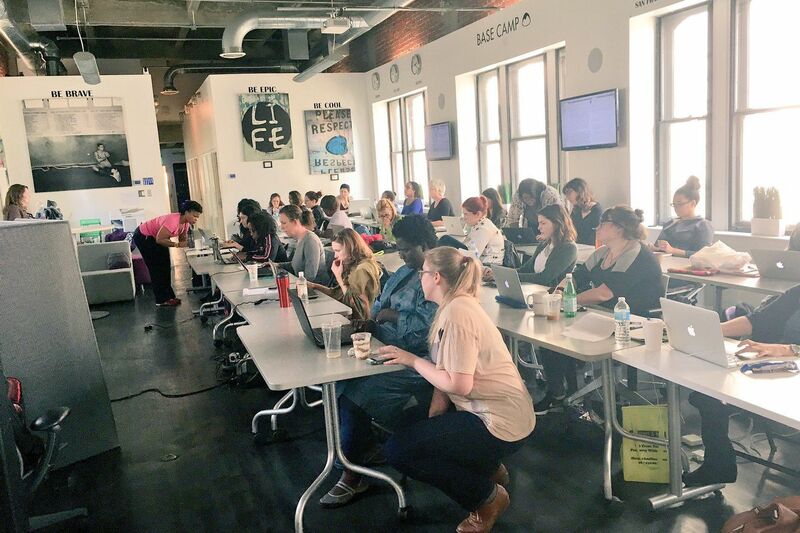 Inside a Girl Develop It Philadelphia course. The Philadelphia chapter of Girl Develop It, the women-focused educational tech nonprofit, has temporarily shut down after the chapter leader, two organizers and a number of instructors left the organization last week, its former chapter leader said. Technical.ly, the tech news outlet, was the first to report that the Philadelphia chapter halted operations. Corinne Warnshuis, Girl Develop It’s executive director, who is white, said the nonprofit is currently working to hire new chapter leadership, but doesn’t anticipate mounting a new team or new events here before April. This temporary shuttering might come to some as unexpected. Girl Develop It has earned praise for its programming, which aims to provide low-cost web-building and software classes for women and nonbinary people across identities. Last year, the nonprofit piloted a coding course in a Delaware prison. Girl Develop It doesn’t have a brick-and-mortar national headquarters, but Philadelphia has been a popular base for members of the nonprofit’s small senior staff. Warnshuis, who was a student in the Philadelphia chapter’s first class, once led the Philly chapter, but became the organization’s first executive director in 2014. Under her leadership, the chapter locations have more than tripled. She now faces calls for her resignation. These departures haven’t been isolated to Philadelphia. Chapter leaders in Boston, Seattle, Denver, Atlanta, and Oakland, Calif, among other cities, have also stepped down. Former faculty who have broken with the nonprofit say that national leadership hasn’t appropriately addressed a pattern of incidents that slighted black developers. Warnshuis maintains that there hasn’t been a pattern at all. “I think the only real pattern is that we’ve been supporting women of color and supporting women throughout our history,” she said in an interview. In December, Shanise Barona, an Afro-Latina Philadelphia-based former staffer of the nonprofit’s national staff, went on the podcast #causeascene, which often focuses on issues of diversity in tech, and said she felt “degraded” after making diversity-conscious recommendations to a peer. She sensed that she was being received as an angry black woman. She described how a coworker would speak to her in a certain manner that she didn’t use with other staffers. She detailed how a colleague sent her direct messages with articles on shootings in her West Philadelphia neighborhood, advising that Barona move somewhere more safe. She criticized the organization for not acting effectively in Minneapolis, where three black women involved with the chapter, one a leader, allegedly were met with disrespect and ignored when they called for better inclusion practices. One tweeted that this had gone on for over the past two years. Over the past couple of years, there have been many occasions when the leadership team has ignored the concerns of their members and even their leadership counterparts. Warnshuis said the organization is looking into Barona’s claims: “We’re taking [them] seriously...."
Barona said she left the organization over its treatment of black women and its handling of diversity-related complaints. Some 200 past and present members, volunteers, instructors and chapter leaders across the country have signed an open letter that outlined grievances against the nonprofit. A wide range of chapters leaders stopped holding events in protest, sharing comments on the ordeal under the hashtag #gdistrike. Warnshuis said the organization’s commitment to diversity has been consistent. But some of those aiming criticism at the nonprofit say these allegations contradict the organization’s core philosophies, which they said only adds to the disappointment. On another note, I was the chapter leader that @shanisebarona mentioned in @KimCrayton1 podcast. This happened in August, and since then I have literally learned of *at least* 1-2 new offensive things EVERY MONTH that @girldevelopit has done to POC involved. Warnshuis was cautious not to discuss many specifics, for legal reasons, she explained. In a statement Monday to the Inquirer, Warnshuis said that the nonprofit addressed what happened in Minneapolis and learned from it. She noted that the nonprofit has created a form for members to report incidents if they “feel unsafe.” She also noted that the organization, with 42 percent of its chapter leaders women of color, has been rebuilding its hiring process “to make sure we find leaders who are, first and foremost, aligned with our values.” It also wants to provide more training regarding diversity and inclusion during orientation. Tracy Levesque, who is white and Filipina, worked as a Girl Develop It instructor in the Philly chapter for six years, said she has been heartbroken to hear allegations of racism in an organization she deeply believed in, where she had devoted so much of her time. In January, the nonprofit had a town hall. Levesque listened in. She was disappointed. GDI was started out of a need for marginalized communities to learn software development in a supportive environment. In recent months, there have been incidents that marginalized the very people we want to include. We are deeply sorry. In the current political climate, Joshi said, more people are concerned with being good allies. But it’s also human to want to take a stand for those who are mistreated, she said. “It’s not just the targets who experience negative reactions, it’s the bystanders as well,” she said. Jocelyn Harper resigned this past fall from the chapter she led in Wilmington. Harper, who is black, openly criticized the nonprofit’s response in late September to the Minneapolis situation. Among her concerns was that post-Minneapolis, the national nonprofit’s inclusion efforts seemed too late and were too broad to address black women specifically, she said. As she read through management’s Slack discussions on the matter, she was livid, but wanted to sleep on it before she did anything further. When she woke up, she was still angry. She emailed her resignation. Harper called mass resignations “almost bittersweet.” She doesn’t think that folks really started to pay attention until white women -- who form the majority of chapter leaders -- began to leave the organization in solidarity.